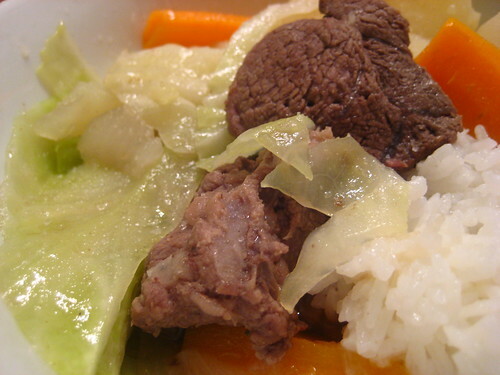 Nilaga is one of my Top 5 Favorite Filipino dishes. It's up there with vegetable lumpia, palabok, fried butterfish with kamote leaves and tomatoes, and kare kare. I've been craving nilaga for a few weeks but can't find my Filipino recipe journal, so I called my mom for a quick how-to on the way home from work. Buy the beef shank with the bone in. Saute onions and beef until the meat starts juicing. Add water (If you're cooking fresh rice, use rice water from the third rinse-through. Add more or less water depending on how much soup you want.) and simmer. When the meat is tender, add patis (fish sauce), then potatoes (I also added carrots for color -- Murdo's idea!) Just before the potatoes are done, add the cabbage. 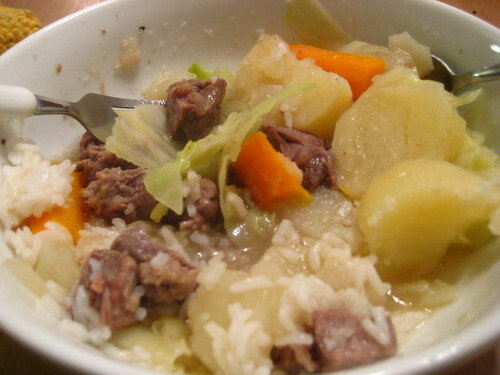 The nilaga is ready when the cabbage is nice and soft, but still has a firm bite. Oh. My. Gosh. Just what I needed. One bite and I'm a little kid again, in Mom and Dad's cozy kitchen, burning my tongue as I shovel heaping spoonfuls of piping hot potato and cabbage into my mouth. Yes, spoonfuls. The last time Murdo ate at my parents' house, he was amazed at the way my dad and uncle used both a spoon and a fork to eat their meals. 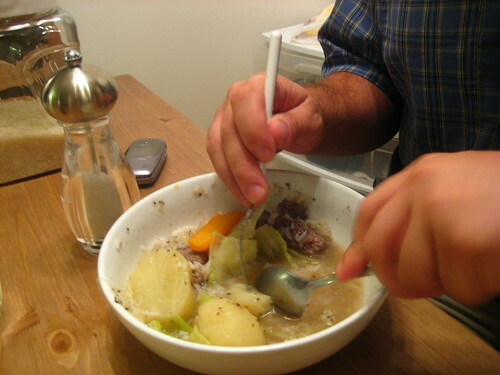 They cut their meat and veggies with the spoon and used the fork to guide the food onto the spoon. Up until my early college years or so, I thought everyone ate with a both a spoon and fork for every meal. But I guess that's just a Filipino thing. This dish requires both spoon and fork. So that's how Murdo ate it. I was so proud of him! He really enjoyed the dish. It even made his Top Filipino dishes, although he's having trouble picking his Top 5. I can't blame him -- it's a pretty tough decision. Filipinos make great food.